If you love Halloween, it’s time to rejoice because October is here! I know I’m not the only one already pulling out decorations and planning costumes. If you’re wanting your pet to get into the Halloween spirit this year, you have to check out these easy (and affordable) DIY Halloween costumes. There’s no reason for you to spend a ton of money on a costume that your dog will only wear one night; and probably not for too long at that. But for a social dog, you can’t beat having them dressed up for a party or to greet trick-or-treaters. 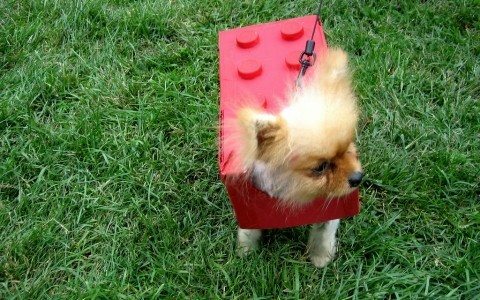 This is an adorably easy costume to put together for a smaller sized dogs. All you need is a shoe box (or any box that fits your dog) and plastic lids. Gatorade lids actually work pretty perfect for this one. Get your scissors and a ball of yarn for this super easy costume. The best part is, they’re meant to be raggedy, so errors are welcome. This one is perfect for dogs and cats or boys and girls. It doesn’t get much easier than this! How cute is this Chia Pet pet, right? This costume is still pretty easy for a DIY, but takes just a few more steps. You can find all the details here at Inhabitat to make your dog or cat your very owe Chia Pet. No matter what you decide to do, your dog is sure to be a hit. Just make sure to keep constant watch on her while she is wearing the costume. Costumes can cause choke hazards and keeping an eye on your dog for any signs of stress is important for their safety. For more safety tips check back for our next post on keeping your dog safe during Halloween. Pinterest – Dressed Up Pets! Is it Wrong to Dress Up Your Pet?